Three Smart Sisters On A Mission In Ecuador! 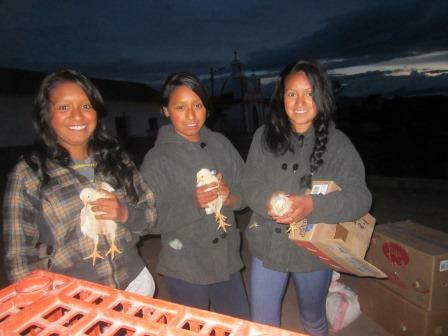 Three sisters.. triplets, from a small town in Ecuador, have put the training and support offered by a ChildFund supported programme to good use. By starting their own business they hope to pay for University education. Is saving even possible in rural, poor communities? That was a question a lot of people asked when the Aflateen program began in ChildFund’s Honduras and Ecuador operations last year. The answer, from the youth themselves, has been a resounding and, perhaps surprising to some, “yes.” Through the programme Ecuadoran youth receive financial training whilst they explore concepts such as self-esteem, their rights, gender issues, drug abuse prevention, the environment and job-seeking skills. The Aflateen project is essentially a global methodology for introducing social and financial education to youth, ages 14 to 24. and the program is a follow-on from the popular Aflatoun which reaches children ages 7 to 13. ChildFund offices in Ecuador and Honduras had been working with Aflatoun, so they agreed to pilot the new Aflateen program in 2011. “I learned to spend my money on what was really useful and not just to waste it,” said another participant. In one activity, youth participants each fill out a chart, identifying money they can earn in a month and what they think they can save. Then they write down the cost of something they want – new shoes, a phone, a month at university. The chart then helps them easily see how much time they will need to save for that item. Saving is difficult, but the youth discover that even very high-cost items are reachable with a good savings plan. In Honduras, 30 youth went through the program, spending three hours in class every other Saturday. They were led by five of their peers, who studied the teaching guide and revised the activities to suit the local context. The program includes modules on personal exploration, rights and responsibilities, savings and spending. As a capstone, the youth design, implement and, if necessary, raise money for small community projects. In Ecuador, youth participated in a high-school-based version of the program. Additionally, a radio broadcast version reached hundreds of youth who live in outlying areas. Beyond financial topics, the radio program introduced themes like first relationships, personal self-image and friendships. The show also offered a hotline number so that youth could call in and ask questions. Young people like the Aflateen program because it’s highly participatory and is attuned to their local experiences and realities. Given the success of the pilots, both Honduras and Ecuador are expanding their programs in the coming year. For Maria Angelina, Maria Beatriz and Maria Fatima the programme has given them the purpose and discipline they need to achieve a good education and be both ambitious and confident about their targets in life. You Are Here: ChildFund Ireland > Blogtitle_li=newsfeed3 > Three Smart Sisters On A Mission In Ecuador!